Hawkins, like all Royal Engineer officers, was a Gentleman Cadet at the Royal Military Academy, Woolwich, where he learned his trade as an engineer, becoming a 2nd lieutenant on 12 Dec 1834. "A party of 16 non-commissioned officers and men, afterwards increased to nineteen of all ranks, under Serjeant James Steel, was detached on the 1st may 1849 with sufficient camp-houses, equipage, and stores, to carry out the re-measurement of the base line on Salisbury Plain, last done in 1794, by means of the compensation bars invented by General Colby. No man of officer on the survey had ever seen the apparatus in position before; and Serjeant Steel, therefore, has the credit of acquiring a full knowledge of the adaptation and the uses of the various instruments belonging to the apparatus, unassisted by the teaching of any practitioner. This he achieved by more than three months unwearied study of some manuscript records on the subject, and by closely observing the results of a series of experiments which he conducted. On the completion of the service corporal Jenkins was entrusted with one of the great theodolites, and removed with a camp party from the base detachment to a mountain station. The remainder were soon dispersed on the general duties of the survey, and Serjeant Steel, after again comparing the bars and microscopes with the standard measures, returned with the compensation apparatus, etc, to Southampton. While on Salisbury Plain Serjeant Steel was visited by the Lieutenant-General Sir Charles Pasley, frequently by Colonel Hall and Captain Yolland, and by about fifty other officers of the royal engineers; also by Professors Airy, Sheepshanks, and Cape. The last gentleman was very free with his inquiries. The mode of aligning the instrument did not, at first, satisfy him, but eventually the process having been minutely explained by the Serjeant, he went away convinced and gratified. Captain Gosset was present at the laying of the first bar and Captain Hawkins at the last." "One Serjeant and fourteen rank and file embarked for Van Dieman's land on the 19th July 1852, on board the "Lady Montagu" as a guard over convicts, in conjunction with a detachment of the line under the command of Captain J.S. Hawkins, RE, and landed at Hobart Town on the 11 December. The Lieutenant-Governor of the colony applied for the assistance of the sappers to constitute, in the first instance, the nucleus of an efficient survey body, and to carry on, both in the city and the distant bush, the trigonometrically and detail survey of the settlement. The men, eleven of whom were married and had families, were selected from the survey companies, and were all competent for the duty both as surveyors and draughtsman. A change in the designation of the settlement caused the [party to be denominated the "Tasmanian Detachment". Very early after its arrival. the legislative council of the colony showed much hostility to the employment of the sappers, and, at last gained the point for which it had pertinacious worked. After a service of nearly four years in the triangulation and survey of Tasmania, the detachment quitted Hobart Town on the 9th February, 1856, and landed at Sydney, for similar duty, on the 13th following." "A detachment had been sent to van Dieman's Land in 1852 at the request of the Colonial Legislature to carry on the surveys of the settlement, but it had barely entered on its duties when a feeling of hostility was shown to its employment. Whenever a chance offered of presenting it in an unfavorable aspect, the Legislative council greedily accepted it, and gave the imperial party the full weight of its opposition. In August of 1855, the Governor-General sent a message to the Council recommending Captain Hawkins who commanded the surveyors, for the appointment of Surveyor-general, but betide a select committee nominated to inquire into its necessity and the Legislative Council, the office was never conferred. Matters went on coldly enough; the Council had grown stubborn in its sentiments: and to show that the colony had a will of its own, notwithstanding a royal warrant had been issued to form the detachment in accordance with the warm wishes of those who had authority to represent the wants of the province the colonial secretary coolly intimated to Captain Hawkins, on the 16th October following, that himself and detachment were at the disposal of the Governor of New South Wales! The men composing the party were volunteers, had made sacrifices to emigrate, had purchased land in the vicinity of their labours, and were collecting about them members of their families, who, by ones and twos, had struggled to leave their English homes and were on their way to distant Tasmania. In revoking the service, the conduct the conduct of the rulers was as heartless and supercilious as absolute; and in beguiling men, by fair promised to volunteer to serve them; then discountenancing their efficient exertions, and finally, without consulting their wishes, arranging for their transfer to any colony which might be in need of such a detachment was a feature in colonial management, strongly savoring of exceptional faith. The end of all was, that a few of the party, sooner then break up their new homes, took their discharges, and the remainder leaving Hobart Town on the 9th February, arrived in five days after at Sydney, to renew in that colony, under the auspices of Sir William Denison, those services so little appreciated by the censors of Van Dieman's Land. Captain Hawkins, still in command of the detachment, fixed his head-quarters at Pananatta." Hawkins is given command of the Land Boundary Survey of the 49th Parallel. The latter is a most valuable man as long as he gets no chance to drink. As a surveyor is competent. He is very intelligent and this is what I employ him for. As a good and obedient soldier he does not shine so much, especially when under Serjt. Rogers, for whom he entertains, I think, a sort of contempt or perhaps, not quite so strong a feeling, say, ridicule. Cowan came out quite strong at Langley with Serjt. Rogers and was the best man of the party. He is on very low pay and I know not since when this has been the case. However, ever since he has been with me, he has done everything that could be wished for and I am very glad he was not sent to England. From what I have heard him say, I know he would have liked it above all things, so there would have been no need to put him on board a man of war to prevent him from bolting. Buttle was one of the men I stopped all boundary pay from but Serjt. Hutchens does not mention him as worthy to have any of it restored, so I suppose he has had some trouble with him. As for Kearney, he appeared before me two days after the Langley affair for drunkenness and as I had already stopped everything that I could, I was obliged to order him 28 days confined to camp, which of course amounts to nothing, but then the time for restoration of pay can be postponed being that of the other men and ought to be. Forgie has been on short pay for a long time, I believe since he last got drunk or otherwise committed himself. When sober, I wouldn't wish for a more willing, hard-working man. I wish to send away the twelve axemen that I have here until the survey down the parallel has been accurately made. Six of them might be sent with Roche and the remainder might be sent off on the Chilwkweyuk trail to repair it if necessary. I have worked out a latitude for this place with weights for the different star places. The probable error of this latitude comes out to be twenty four feet. The latitude is 49.2 degrees 2 hours 12 minutes. One of our men, Freeborn Gardner, gave notice to quit last Saturday so I have paid him up. I can only (and that only PERHAPS) pay the others up to the first of this month. Many of them are hard up for boots which I believe they can buy at Chilukweyuk. I have not been able to get any from Langley lately. If you will have some mules, say six, to make sure sent tomorrow, the axemen will be ready at Serjt. Hutchens' camp at midday which will give them enough to get to your camp the same day. If I had a surveyor now I could leave this tomorrow myself as I have as accurate a latitude as I want for lines down to the parallel and a trail also crossing it all of which ought to be surveyed accurately. Ryan, T. Smith and Kearney had all their boundary pay stopped till further orders. Jenkins 6 pence a day also. McTirnan 6 pence a day till further orders. [G.] Birch 7 days Boundary pay stopped and 6 pence a day till further orders. All the men had either 14 or 18 days confinement to camp. The crimes are all entered in the order book which I do not send as I understood from you that you would probably visit this station shortly. Yesterday was a disappointment and today is not much better although the men are at work. I send two Indians, the younger of which I have had employed here since the 26th May inclusive at $1 a day. His name is Isthlaten. He is strong and willing to work. The other man I know nothing about except that he is said to be well acquainted with the Slepe country. As far as I can make out from him, a good mule trail can be made to the entrance of the valley and some way up it. The mountain which has to be turned after leaving Coustas trail is, I understand him to say, very steep, right down to the Chilukweyk river but it is earth and not rock, so that, with a little spade work, a trail could be got through. I also understand that this steep part over which the trail has to go or rather, along which it has to go, is about half a mile in length and then all is plain sailing again. Of course, I cannot be dead certain of all this but it is the best that I can make out. I think it is better to send the Indian to you so that Roche may make a fair start with every necessary. I hope the sextant and the other instruments have been got up from Sumas. They might be packed on the backs of good and safe mules. I think where the trail is as good as it is between Sumas and your camp, care being taken that the mule is lightly laden and it would perhaps be as well to have an animal with such a precious load led and then it could not stray and smash the boxes against the tress, etc. I think while Roche is making the trail, a pocket compass will be sufficient to guide him. I don't think he is up to sketching with the prismatic compass and moreover sketching Coulter trail would delay him too much. If he does sketch, I will have the necessaries sent to him - I confess I hardly like sending away a pocket chronometer on such a break-neck expedition although if the sun does not come out it will be almost necessary in order to take stars satisfactorily. However it will be as well for Roche to remember that there is no use in his taking a latitude at all, until he gets into the Slepe valley, where his course will be as near south as the valley will permit. While running east latitude observations will be of but little service unless the trail is accurately traversed. By the by, I suppose Roche is aware that the variation of the needle in these parts is about 21 1/2 degrees or 2 points East of true North. If the two boxes of magnetic instruments were carefully packed on a led mule and sent here, I could take some observations while the survey is going on. The two men that I retain were required to complete the second trail down to the parallel and by sending them with the surveyors to carry the instruments or clear away an intervening bough, I hope to get on much quicker that otherwise. If the magnetic instruments are sent, one set of legs will be sufficient (the longest). The name of the older Indian is Telichkil. 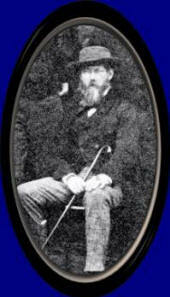 In December of 1859, Lt. Samuel Anderson joins the Commission while Hawkins is away in England. He has this to say about his Colonel. None of them [other officers of the Commission] seem to like Colonel [Hawkins] as he is said to have rather a petty and mean disposition. However I intend to be prejudiced but to give him a fair trial. One bad trait in his character and particularly Gosset's is running down that unfortunate man Col. Moody. As time passes, Hawkins still does not return from England. "Our Commissioner Col. Hawkins has not yet arrived here but he is expected by the next mail in a few days. The ship that brought the last mail from San Francisco to Victoria was lost a short distance from here and most of the passengers were lost, including a son of the late Bishop of London. We thought that Col. Hawkins was in that ship, but were delighted at finding that he had missed that one and was coming on by the next." "The Colonel being here has made very little difference in our ordinary mode of living, but he is a very amusing man and so methodical that he is quite a curiosity in his way. He is very touchy about his own dignity, and is by no means friendly towards Moody, as he fancies that the latter wants to order him about, which I think is quite a mistaken notion of his." "The Colonel was looking over the Mess bill the other day, the expense of which is as you know defrayed by the public, and he saw one of the items was put down as "Golden Syrup" in other words common treacle, whereupon he had it struck out of the account saying that it was luxury that must be paid by the officer's themselves. We had a great laugh at this, as we can get enough for a shilling to last us a fortnight, and it certainly was a great luxury for when in the bush, we had nothing to eat with our bread at breakfast and tea. I believe he thought it was some costly preserve." "(While in Rock Creek) I heard that while I had been away Colonel Hawkins had passed thro' the town dressed in a most ridiculous way, having a large red shirt on outside everything, which however is intended to be worn under the waistcoat. But he was determined to be peculiar and ridiculous so he put it on outside everything, as a sort of pin-a-fore, and a painfully new looking belt round his waist with a grand Sheffield hunting knife, which of course has never been used. The people all imagined he had his red soldier's coat on, so they all give him credit for more folly then he was actually guilty of. And to make up for the inconvenience of having no pockets at all anywhere, and which I have found indispensable, he carries about a multiplicity of bags and reticules strapped round his body, and in fact got-up entirely for show. I believe he is going to have his portrait taken in that costume to send his wife, telling her that that is the dress of the country." "We had a great laugh at his missing 3 shots at some grouse, all of which he declared were severely wounded. After that, he always puts in a heavy charge of shot, and goes as close as possible to the doomed bird, and gives it the whole charge. One day he murdered a large bird in this way and said he would have it weighed when he got home, so I told him not to forget to subtract 1 1/4 oz. for the whole charge of shot he had lodged in the bird. He merely laughed and said 'Well, you know, you can hardly call this sport'." "We spent a very quiet Christmas this year. Last year the Men had a grand dinner, and invited all the officers in to dessert, the Colonel being away at that time in England. They then proposed and drank the health of each one individualy, and on the whole there seemed to be the best feeling existing between the officers and Men. This time it was very different in consequence of the presence of the Colonel of whom I am sorry to say the Men have the greatest aversion, and this feeling was known to their comrades at home before I came out, for the home people could not get any Men to volunteer to join the Boundary Commission altho' such high rates of pay were offered, all in consequence of the bad name the Colonel has among the Men. To show you that this feeling is not without foundation, at about 10 o'clock on Christmas night the Colonel hearing a man singing and making himself merry came out of his room and had him locked up in the Guard House, and the unfortunate man spent the remainder of his Christmas night there. That night the Colonel retired from us at about 10, and immediately afterwards all the singing voices of the Men came outside the Mess Room and sang all kinds of songs suited to the occasion, in which we all joined Chorus, and these festivities were kept up to a late hour, finishing up with God Save the Queen and three cheers." "All the Men who came out with me with the exception of one are getting on very well. That one deserted at the be- ginning of the year in consequence of being punished too severely for some thoughtless irregularity. Their Serjeant is a great man in authority and is quite independent of all the other sergeants which is a great advantage. He has charge of all the provisions and stores and has no other duty at all to perform. He and the Colonel don't get on very well together, but as scarcely any body does not get on well with the latter it is not to be wondered at." "Our Colonel is sometimes very amusing about money matters, and I should think the most unpleasant man possible to do business with. He wanted me to buy some iron for him the other day, and said "Mind you beat them down." So I merely inquired the price and left him to conclude the bargain. He was always tormenting me about the prices of things, and we found out quite casually the other day that he keeps all of his wife's accounts and strikes bargains with his butcher and his baker and his cat's meat man, and in fact manages all the household accounts." Chief Commissioner of the British North American Boundary Commission, 1858 - 1869, with rank of Captain - promoted to Colonel 1868.